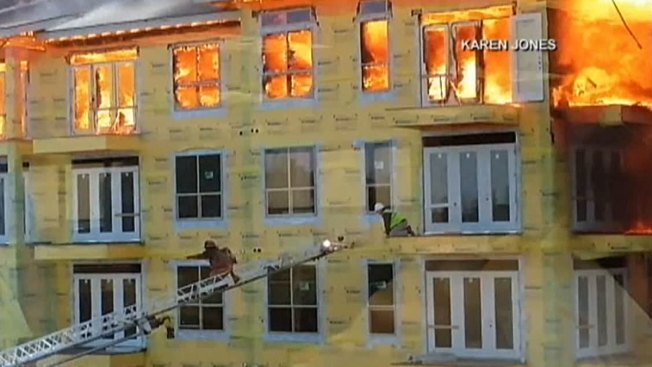 A construction worker climbed down from the top floor of a burning building near downtown Houston and was plucked to safety moments before its collapse, video that captured the dramatic rescue shows. Gusty winds turned what had been a small rooftop fire into a massive blaze that destroyed a large apartment complex under construction near downtown Houston, authorities said. The Tuesday fire gutted the 396-unit, 4 1/2-acre Axis Apartments project in the city's hip Montrose district. The roof and the shell of the expansive structure collapsed as the flames turned it into a charred ruin. All construction workers who had been in the high-rise building were accounted for, and no injuries were reported. Fire officials said more than 200 emergency personnel battled the fire for 2 1/2 hours before bringing it under control. Witnesses said the fire started about 12:30 p.m. Tuesday on the northeastern corner of the roof but spread rapidly through a breezeway. "There was a report of a couple of guys working on the roof doing welding," Houston Fire Department Deputy Chief Greg Lewis said. "When our units arrived, there was a small fire and construction workers were attempting to put it out. There was sustained wind of 15 to 20 miles an hour, and it was a wind driven fire." The cause of the fire is still under investigation, Fire Capt. Ruy Lozano said. The department said the blaze that sent thick, black smoke billowing in to the sky prompted the evacuation of nearby buildings. Firefighters also sprayed nearby houses and apartment buildings with water to prevent heat and embers from spreading the fire. No other buildings were damaged, but plastic fixtures melted on some nearby vehicles.